From the day we were born, everyone was given special gifts. These came in the form of natural, above average talents...usually creative in some way, but not always. 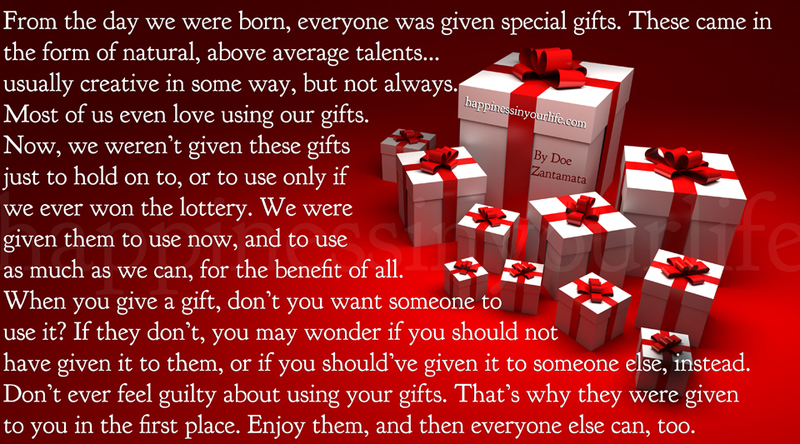 Most of us even love using our gifts. Now, we weren't given these gifts to hold on to, or to use only if we ever won the lottery. We were given them to use now, and to use as much as we can, for the benefit of all. When you give a gift, don't you want someone to use it? If they don't, you may wonder if you should not have given it to them, or if you should've given it to someone else instead. Don't ever feel guilty about using your gifts. That's why they were given to you in the first place. Enjoy them, and then everyone else can, too.